Business Loop I-80 trailblazer posted along the off-ramp (Exit 3) from Interstate 80 west to South Verdi Road. Photo taken 07/18/09. Doubling as Nevada 425, Business Loop I-80 through the community of Verdi overlays a portion of old U.S. 40 along 3rd Street. Verdi, located just east of the California state line in Washoe County, is unincorporated. The 3.44 mile route of Nevada 425 originates from I-80 at Exit 1 and concludes at Exit 4. A folded diamond interchange connects Interstate 80 with 3rd Street (FRWA48) on the west side of the freeway and FRWA01 (Washoe County Frontage Road #1) on the east side at Exit 1. FRWA01 measures 0.462 miles from the right of way fence to the beginning of SR 425 on 3rd Street. Photo taken 07/18/09. FRWA01 serves a handful of businesses and dwellings along the east side of Interstate 80. The frontage road provides return access to I-80 toward Reno from the west end of SR 425. Photo taken 07/18/09. The first confirming marker for Business Loop I-80 east appears along Gold Ranch Road (FRWA48), which extends north from Mahogany Canyon Court to the north side ramps of I-80 at Exit 1. Photos taken 07/18/09. Business Loop I-80 (Gold Ranch Road) continues north from the ramps at Exit 1 toward Gold Ranch Casino and SR 425 along 3rd Street. Photo taken 07/23/09. Gold Ranch Road (FRWA48) intersects the off-ramp from I-80 west at Exit 2. Gold Ranch Road ends in name here. Photo taken 07/18/09. Second photo taken 07/23/09. Business Loop I-80 along FRWA48 shifts westward to intersect Trelease Lane. Photo taken 07/17/17. FRWA48 ends as SR 425 takes over for Business Loop I-80 eastbound along 3rd Street into Verdi. Photo taken 07/17/17. FRWA01 brings traffic from I-80 eastbound onto SR 425 (3rd Street) north while connecting the south end of Verdi with the freeway leading east to Reno. Photo taken 07/17/17. Although unmarked, Nevada 425 commences its 3.44 mile route as the two branches of Business Loop I-80 combine along 3rd Street. Photo taken 07/17/17. Business Loop I-80 & Nevada 425 proceed northward along historic U.S. 40 (3rd Street) into Verdi. Crystal Peak Park separates 3rd Street from I-80 and the nearby Truckee River on the ensuing stretch. Photo taken 07/23/09. Business Loop I-80 and historic U.S. 40 (3rd Street) span the Truckee River for the first time eastbound on a 1939-built concrete arch bridge. Photo taken 07/23/09. The next turnoff from Business Loop I-80 east is for Crystal Peak Park. Nevada State Historical Marker 191 follows. Photo taken 07/23/09. 3rd Street next spans a power canal on a 1949-built span. Photo taken 07/23/09. Arriving at the Verdi business district, Business Loop I-80 (3rd Street) intersects Bridge Street. Bridge Street connects with South Verdi Road to I-80 at Exit 3. Bridge Street north continues to the county library, golf course, and Dog Valley Road west to Henness Pass Road in California. Photo taken 07/23/09. Eastbound Business Loop I-80 (Third Street) passes Rattler Ridge and Verdi Armory. Photo taken 07/23/09. The east crossing of the Truckee River along Business Loop I-80 and historic U.S. 40 is a concrete arch bridge dating back to 1938. Photo taken 07/23/09. Development of the Glen Meadows Estates and Village subdivisions on the north side of Business Loop I-80 beyond the Truckee River transformed a previously rural stretch into a bedroom community for Reno. Photo taken 07/23/09. Business Loop I-80 curves south and squeezes between the adjacent Truckee River and a rocky hillside south of Peavine Peak. Photos taken 07/23/09. Business Loop I-80 & SR 425 straighten out by a handful of industrial businesses on the approach to Somersett Ridge Parkway and I-80. Photo taken 07/23/09. The roundabout with Somersett Ridge Parkway precedes the eastbound return of Business Loop I-80 onto Interstate 80. Somersett Ridge Parkway comprises one of three roads into a sprawling suburban area north of I-80 and Mogul. Photos taken 07/23/09. The roundabout with Somersett Ridge Parkway along Business Loop I-80 & SR 425 was completed by 2008. Somersett Ridge Parkway winds northward to the Sierra Canyon Village and Sierra Canyon at Somersett Village developments, ending at Del Webb Parkway. Photo taken 07/23/09. Business Loop I-80 & SR 425 conclude at a wye interchange with Interstate 80 east to Mogul, Reno and Sparks. Photos taken 07/23/09. Business Loop I-80 westbound departs from the mainline freeway at Exit 5. Combining with SR 425 along old U.S. 40, the Verdi business route quickly enters a roundabout with Somersett Ridge Parkway. Photo taken 07/17/17. The roundabout with Somersett Ridge Parkway serves a bevy of subdivisions spreading to the northeast of Verdi and north of Mogul including Sierra Canyon at Somerset Village. Photos taken 07/17/17. Business Loop I-80 & SR 425 curve west into suburban areas of east Verdi, crossing the Truckee River for the time across an open-spandrel arch built in 1938.1 Photo taken 07/17/17. 2nd Street branches west from Business Loop I-80 & SR 425 (3rd Street) at the Verdi business district. Photo taken 07/17/17. Historic U.S. 40 (3rd Street) crosses the Truckee River again by Crystal Peak Park. The 181-foot long open-spandrel arch bridge here dates back to 1939.2 Photo taken 07/17/17. Looking south from 3rd Street at the 1962-spans carrying Interstate 80 across the Truckee River in west Verdi. Photo taken 07/18/09. 3rd Street leads Business Loop I-80 & SR 425 southward to a folded diamond interchange with Interstate 80. SR 425 ends here as the business loop separates into two state-maintained frontage roads. FRWA01 connects with the eastbound entrance ramp to Reno. Photo taken 07/17/17. FRAW48 runs along the west side of I-80, extending Business Loop I-80 south to Gold Ranch Road and the entrance ramp at Exit 1. Photo taken 07/18/09. A trailblazer for Business Loop I-80 stands along Gold Ranch Road (FRWA48) southbound between the Interstate 80 off-ramp from Exit 2 and entrance ramp at Exit 1. Photo taken 07/18/09. Gold Ranch Road (FRWA48) runs directly along side the westbound lanes of I-80 through Exit 1 and Mahogany Canyon Court. Photo taken 07/18/09. 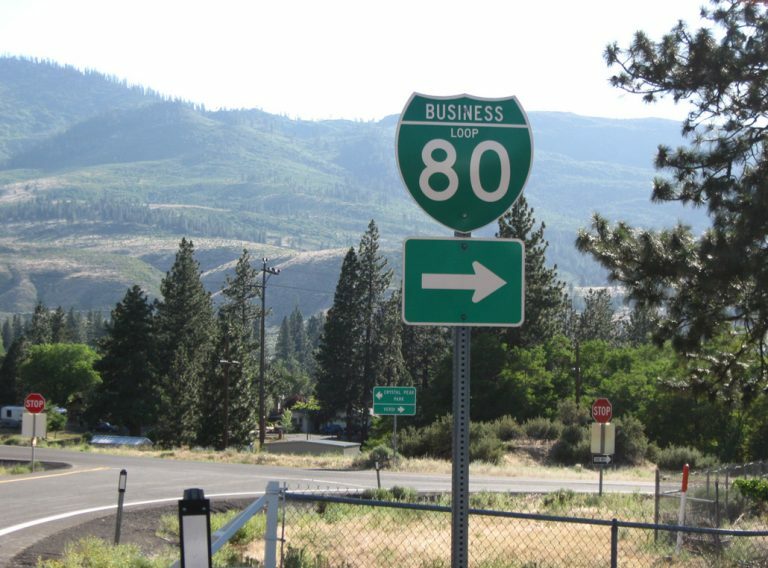 Business Loop I-80 along Gold Ranch Road merges onto Interstate 80 west ahead of Truckee Canyon in Sierra County, California. Mahogany Canyon Court spurs southwest to a handful of dwellings overlooking the valley from Verdi Range. Photos taken 07/23/09. FRWA01 spans I-80, connecting Business Loop I-80 west with the entrance ramp for Interstate 80 east to Reno and Sparks. Photo taken 07/17/17. FRWA01 extends a short distance south from the I-80 eastbound on-ramp to the right of way end at the first Verdi exit ramp from I-80 west. Photo taken 07/17/17. Trailblazers for I-80 direct motorists leaving Crystal Park onto Business Loop I-80 & SR 425 (3rd Street). Photo taken 07/18/09.